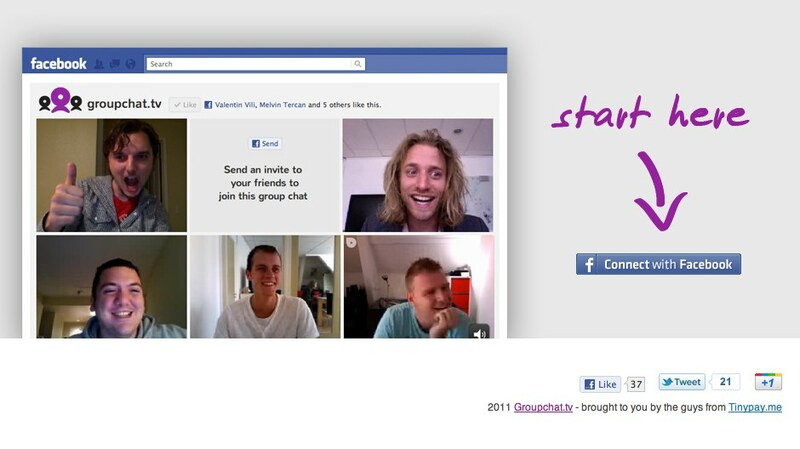 Groupchat.tv is a new Facebook application that brings a Google Hangouts-like group video chatting experience to Facebook. The app was created over the course of the weekend, during the HAPI hackathon in San Francisco, by the same folks who run e-commerce site TinyPay.me. And here’s the crazy part – Groupchat.tv supports up to 50 video streams at the same time! The app’s creators don’t recommend you push Groupchat.tv quite that far, however. But it is notable that there’s not the same hard-coded limit of 10 people per chat as there is over on Google+, where “Hangouts” are one of the site’s key selling points. To video chat on Google+, you launch a Hangout (a video chat session) by clicking a button and then share it with a Circle or Circles, individual friends or the general public, as you choose. To use Groupchat.tv, you must first authorize the Facebook application, then share the special link it generates with your friends. The link can be shared via instant messaging, such as in Facebook’s own chat, for example, via email, Wall post, or however else you choose. 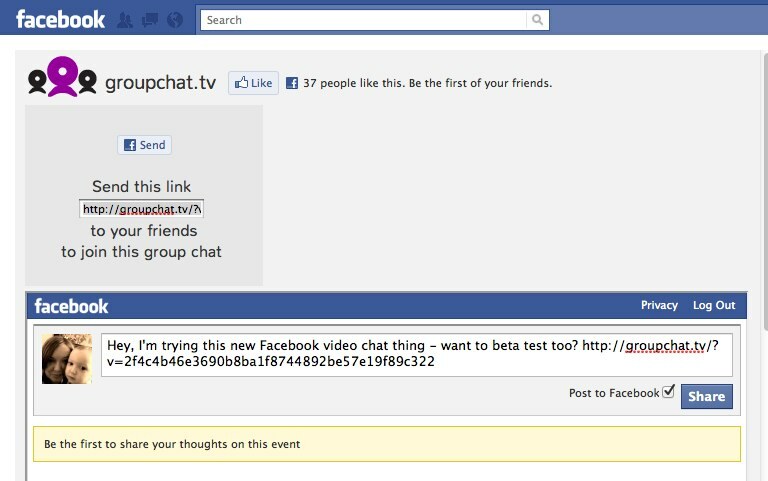 Groupchat.tv’s main interface provides you with a Facebook status update box, though, which makes the sharing process relatively easy. Your friend will also have to authorize the Facebook app before being able to chat with you. In testing Groupchat this morning, we ran into the typical Mac/Flash trouble (it’s doesn’t “just work” – you have to configure your Flash settings here.) However, the app at least provides with a simple “how to” pop-up that explains how to make the necessary changes. Groupchat.tv, which uses Tokbox’s opentok API, isn’t as smooth as either Google Hangouts or Facebook’s own Skype integration, of course. You can hear your voice echoing on your friends’ PC speakers, for example. But if you’re dying to group chat with Facebook friends, it’s certainly worth a look. According to the app’s lead developer, Melvin Tercan (also Tinypay.me’s Co-Founder and CEO), the team is already tossing around ideas for new features, like a public list of group chat that everyone could join. But for now, they’re just hoping the app takes off and goes viral. Think that might happen now? Update: I should have noted that this app posts a message to your Facebook Wall when you launch a chat session. Automatic Wall posts seem par for the course on Facebook, so I wasn’t surprised or taken aback by this. You, however, may feel differently. Be warned! Correction: This article originally gave credit to Richard Straver because Melvin Tercan emailed us using Richard’s email address. Oops!